The twenty-third session of the UNECE Committee on Environmental Policy (CEP-23) is scheduled to take place in Geneva from 14 to 17 November 2017 (Palais des Nations, salle VII). Meeting documents are being made available on this webpage. How can we galvanize support to green our economies? At the Eighth Environment for Europe Ministerial Conference (Batumi, Georgia, 8–10 June 2016), ministers endorsed the Pan-European Strategic Framework for Greening the Economy –– a tool supporting countries’ efforts in transitioning to the green economy and, at the same time, contributing to the implementation of the Sustainable Development Goals (SDGs). To make the Strategic Framework a reality, ministers also launched the Batumi Initiative on Green Economy (BIG-E) that consists of voluntary commitments to operationalize the Strategic Framework until 2030. The Strategic Framework and BIG-E are serviced jointly by the UNECE, UNEP and GGKP. At present, 117 commitments have been submitted by 25 countries and 13 organizations. These commitments specify concrete actions for moving towards greener and more inclusive economic patterns. With regard to air quality, ministers reconfirmed their commitment to reduce air pollution and protect public health and ecosystems by endorsing the Batumi Action for Cleaner Air (BACA). Thus far, 27 countries and 4 organizations have submitted 108 voluntary commitments to this initiative. The BIG-E and BACA initiatives remain open for stakeholders to join. 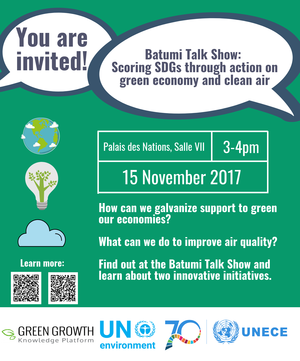 Countries are invited to announce their new commitments for greening the economy and cleaning the air in a talk show format. Promoting the Batumi initiatives with the participation of countries that have joined them with a view to attract new countries and additional voluntary commitments for greening the economy and cleaning the air, and advance the achievements of SDGs. Time: 1.15 – 2.45 p.m.
Organizers: the United Nations Economic Commission for Europe (UNECE) and the United Nations Environment Programme (UN Environment). The event is in English and Russian, with the support of Norwegian funding to UN Environment. The “Greening Economies in the Eastern Neighbourhood” (EaP GREEN) project, launched in 2013 and funded by the European Union, has been an important means to support the six EaP countries (Armenia, Azerbaijan, Belarus, Georgia, the Republic of Moldova and Ukraine) to progress faster towards a green economy through better management of natural capital in a context of higher economic productivity and competitiveness. The side event at CEP-23 will highlight, in an interactive way, selected outcomes of the Project and their contribution to greening the economies in the EaP countries. English-Russian interpretation will be provided. For further information please contact: Krzysztof Michalak and Irina Belkahia.